Learn French in Aix-en-Provence at our partner French school, IS - Aix. Specialised in teaching French as a foreign language to adults for over 35 years, IS-Aix welcomes students from over 40 different nationalities who all come to Aix-en-Provence with the goal of learning French. 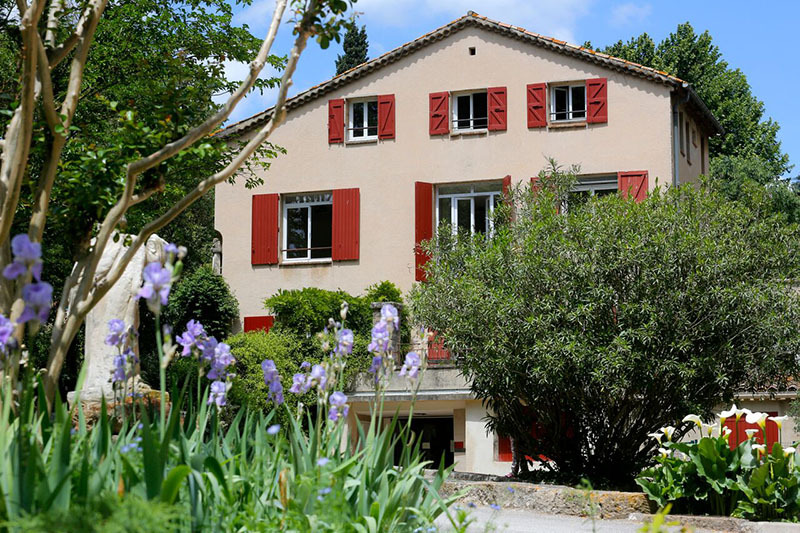 The school is located in a charming former private mansion with beautiful gardens, close to the town centre. The nearest French ski resorts are also just 2 hours away from Aix-en-Provence. For long term courses, we recommend the trimester course. The Intensive French course with 30 lessons includes general French lessons in the mornings and theme workshops in the afternoon in which to widen your knowledge about French civilisation and conversation using creative workshops amongst other topics. There are also another 2 additional optional conference lessons per week available to students. Beginners cannot take this course, an intermediate level of French is required. To participate in the intensive course with 30 lessons, an intermediate level of French is required. A host family based on B&B can only be booked up 3 weeks. Students are not allowed to use the kitchen. A double room is only available for 2 people travelling together. Accommodation in a studio or hotel is possible on request (prices may vary). Courses with a duration of one week can only be booked on request. Activities such as painting, horseback riding and golf can be booked through us but will have to be paid on the spot in Aix-en-Provence. The school charges a reservation fee of € 50, which will be invoiced by StudyTravel. In 2019 the school is closed on: 01/01/2019- 06/01/2019, 22/04/2019, 01/05/2019, 08/05/2019, 30/05/2019, 10/06/2019, 14/07/2019, 15/08/2019, 01/11/2019, 11/11/2019 & 25/12/2019. Lessons missed on national holidays will be rescheduled on other days (except for the Christmas holiday). It is possible to book individual lessons during the Christmas holiday. If you would like to stay for a longer period in Aix-en-Provence, the trimester course might be a good option. This course of 8, 16 or 24 weeks offers 20 lessons of general French per week. The trimester course is also a good preparation for the DELF exam. This exam is not included in the price but if you wish you can take this exam in Cannes, Montpellier or Lyon. In addition to an Intensive French course (20 lessons per week), it is also possible for students to take French cookery lessons in the afternoon to learn about Provençale cuisine, French wine, local products and gastronomic vocabulary for a period of 2 weeks. In order to take this course you must have at least a basic level of French. The cookery lessons (approximatly 8 hours per week) are held in groups of at least 4 students and students should at least have A1 level. The teacher course of 2 weeks (1 week only possible on request) takes place in summer on set starting dates. The course consist of 30 lessons, from which 20 lessons are dedicated to general French (in groups of maximum 10 participants) and 10 lessons are especially designed on today’s French society and on methodological themes on how to improve classroom practice. These lessons are in groups of maximum 15 participants. You’ll need at least B1 level to be able to participate in this course. The teacher course is eligible for Erasmus+ funding; please contact us for more information. Living with a French host family whilst you learn French in Aix-en-Provence offers students the unique opportunity to become fully immersed in the French way of life during their stay. Students can stay in an individual room on either a bed and breakfast or half board basis. It is also possible to choose an accommodation only option, with use of the family’s kitchen. If you stay with a host family where you already have meals included, it is not possible to use the family kitchen to prepare your own food.